Various means of therapeutic intervention into degenerative aging processes are now gaining increasing interest. The interest is largely due to the mounting challenges of the rapidly aging world population and the correspondingly strengthening desire to seek solutions.1 Yet, when searching for means to intervene into degenerative aging processes, the emphasis is often placed either on traditional means of life-style improvement (rest, exercise, moderate and balanced nutrition) or various pharmacological means (the so-called geroprotective or anti-aging drugs)2 or gene-therapeutic or cell-therapeutic means (the so-called regenerative medicine).3 Yet, additional classes of potential interventions may be possible. Anti-aging and life-extending interventions do not necessarily need to be behavioral, biochemical or biological, but can also be physical, in particular as relates to various resuscitation technologies for the elderly, for example hypothermia and suspended animation,4 electromagnetic stimulation,5 or oxygenation (also in a sense a “biochemical” intervention, but with a stronger emphasis on physical energy metabolism and physical properties, such as gas pressure). Such technologies represent some of the most veritable means for life extension, demonstrably saving people from an almost certain death in severe acute conditions. But similar principles could perhaps be used for more preventive treatments and in less acute cases. This work will focus on means of oxygenation, in particular hyperbaric (high pressure) oxygenation. It may be stated that 100% cases of death, including aging-related deaths, ultimately are caused by a lack of oxygen supply. Hence, various means of oxygenation may be considered as anti-aging means. On the other hand, oxidative damage has been long associated with the aging process.6 From early times, human life has been likened to a burning candle: too much and too fast burning (oxygenation) could lead to an early death.7 Hence efficient oxygen supply management may be essential for maintaining healthy longevity. This article draws attention to the issue of oxygenation, in particular the use of hyperbaric oxygen therapy. It is not intended as a clinical guideline, but as a reflection on a potentially important issue and an invitation for further consideration of physical, energy-modulating means for anti-aging and life extension, in particular oxygen management by such means as hyperbaric oxygenation therapy.8 Some other physical means, such as temperature manipulation and electromagnetic stimulation, are also briefly considered with the same purpose to stimulate further interest. However, in high concentrations, oxygen can be cytotoxic. On the positive side, oxygen toxicity against bacteria may partly explain beneficial effects of hyperbaric oxygenation for treating acute infections, as well as wound, burn and fracture healing, where infections can be a major obstacle to effective healing.10 The cytotoxic effects may be also involved in anti-cancer treatment, to destroy cancer cells by high oxygen concentrations.11 Yet, the oxygen cytotoxic effect can be problematic, when either the oxygen dose or the time of exposure to oxygen exceed a desirable physiological threshold.12 Oxygen can lead to excessive cell and tissue stimulation, exhausting cell replicative potential, increasing the amount of reactive oxygen species and hastening the transition to apoptotic cell death via mitochondria activation.13 The thresholds of oxygen toxicity have been uncertain even regarding single time applications of hyperbaric oxygenation.14 And long-term effects of hyperbaric oxygenation on human life span apparently have not been studied. The mechanisms of potential general protective and/or anti-aging (geroprotective) effects of hyperbaric oxygenation, if such are indeed present, are yet to be elucidated. The question of dosages may be also critical for determining the mechanisms of such anti-aging effects. High dosages of hyperbaric oxygen should intuitively induce oxidative stress, with high reactive oxygen species (ROS) production, which has been long seen as one of the major sources of molecular damage in aging.6 Indeed, oxidative damage has been observed under hyperbaric oxygen treatment, among other effects potentially contributing to cataract development.15 Yet, it is also appreciated that, at certain levels, ROS may stimulate tissue regeneration.16 And yet at certain dosages, hyperbaric oxygen may produce stimulatory “hormetic” effects (i.e. stimulation by a low dose, as opposed to inhibition by a high dose of the same factor), which may in fact increase anti-oxidant protection, via stimulation of anti-oxidant defense systems.17 In other words, under a certain non-dangerous threshold, ROS generated due to hyperbaric oxygenation may stimulate the body’s anti-ROS defense. Closely related to the phenomenon of hormesis (low dose stimulation), hyperbaric oxygenation may exert protective anti-ischemic effects through ischemic preconditioning, that is applying a certain sub-threshold dosage of hyperbaric oxygen that would induce a transient, mild ischemia that would create tolerance to subsequent, more severe ischemia.24 This mechanism opens the possibility for using hyperbaric oxygenation as a preventive therapy for the elderly. Some of the mechanisms of preconditioning were associated with enhanced expression of protective enzymes, such as Sirtuins,25 enhanced mitogen-activated protein kinases (MAPKs) and autophagy,26 and inhibiting the mechanistic target of rapamycin (mTOR) enzyme pathway.27 Thus, the mechanisms of preconditioning by hyperbaric oxygenation may be similar with the application of other geroprotective medicines (e.g. Sirtuin-stimulating or mTOR-inhibiting drugs),28 producing a general improvement of energy metabolism, yet potentially with fewer pharmacogenic side effects. However, this possibility will yet require extensive investigation, necessitating a very careful consideration of the dosages. The short vs. long term effects should be considered when studying the mechanisms of action of hyperbaric oxygenation.29 Indeed, there may be a need for a systemic, long-term evaluation of oxygen therapy effects, as a part of a whole-organism whole-life-course model of energy resources expenditures. Such models are currently only emerging,30 and are in great need of elaboration, both experimental and theoretical. Hyperbaric Oxygenation can be seen as a potentially effective therapeutic or stimulating means, but it is unclear to which extent it can serve as a lifespan-extending means. Hence, the therapeutic modality of Hyperbaric Oxygenation may be supplemented or followed by additional modalities particularly designed to serve life-prolonging, rejuvenative and reparative functions. Pressure chamber could in principle provide a convenient environment to implement such modalities, insofar as it provides a protected, isolated and enclosed space unit, which can be easily manipulated and monitored for a variety of purposes. Some of the potential reparative applications can be as follows. Interestingly and seemingly paradoxically, both hyperbaric oxygenation therapy and its apparent opposite – therapeutic hypoxia or hypoxic training (for example intermittent hypoxia) have been suggested to produce positive preconditioning effects against ischemic aging-related conditions, such as heart disease and neurodegenerative diseases.33 The apparent paradox may be once again explained by the phenomenon of “hormesis” – namely the activation of anti-hypoxic/anti-ischemic protective mechanisms by certain extents of both deficit and excess of oxygen (in the latter case possibly increasing reactive oxygen species levels to induce a protective counter-effect), as well as possibly by other mild stressors (chemical, mechanical or electrical). The precise dosages and thresholds of such similar protective effects by seemingly diverse means, as well as their potential common central neuro-humoral regulatory mechanisms, yet require elucidation. Besides hyperbaric oxygen therapy, normobaric (normal pressure) oxygen therapy, or just oxygen therapy generally (increasing oxygen supply) has been a widely practiced means of therapy and resuscitation.34 While hyperbaric oxygenation (using a pressure chamber) may be more effective to achieve rapid oxygen delivery to deep vital tissues, normobaric oxygenation (e.g. using an oxygen mask) may be more conveniently applicable and less expensive. Yet for normobaric oxygenation too, the appropriate balance of O2/CO2 levels may be critical. The pressure chamber may provide an ideal environment to control both O2 and CO2 levels and pressures, for acute therapeutic or prolonged restorative regimens. Still, with regard to CO2 manipulation, its exact therapeutic dosages, long-term effects, as well as its effects on immediate daily performance, will yet need to be established. The monitoring of the gas composition (PaO2 and PaCO2) of the arterial blood may be seen as a necessary condition to perform effective hyperbaric oxygen therapy against life-threatening situations in patients with deteriorating cardio-respiratory functions, especially for the elderly patients.8 This is necessary in order to control and maintain adequate levels of lung gas exchange, with regulated parameters of oxygen supply and controlled oxygen concentration. The speed of the blood flow and blood pressure in vital organs are also among the critical vital signs that need to be known. The basic parameters of cardio-respiratory function need to be monitored, such as: PaO2 mmHg – arterial partial pressure of oxygen; PaCO2 – arterial partial pressure of CO2; PaO2/FiO2 – the ratio of the partial pressure of oxygen to the fraction of inspired oxygen; SVI ml/m2 – stroke volume index; CI L/min/m2 – cardiac index; pH – blood acidity level. Such measures of cardio-respiratory function can help reference the normal balanced O2/CO2 levels in the blood and favorable blood electric charge and hemodynamic conditions. The main clinical utility of biomarkers or diagnostic parameters of aging is that their changes can help evaluate the effectiveness of particular therapeutic regimens, especially the effectiveness of particular therapeutic dosages. Yet curiously, in hyperbaric oxygen therapy, the concept of dosage is only rudimentary and there is no commonly agreed way to define the dosage. Moreover, there is no agreed way to evaluate the effects of this kind of therapy, and correspondingly no agreed way to correlate between the dose and the effect. The same may be said regarding other potential “energy-modulating” interventions into aging, whose definition is yet very nebulous. However, such a definition of the dosages has not become consensus, and the definitions of the therapy effects and of the dose-effect relations are rather vague and yet require a thorough elaboration and clarification. Hopefully, thanks to refinement of the definitions and massive additional data collection on dose-effect relations, including the evaluation of long-term effects and differential personalized effects in different patient groups (e.g. the elderly vs. the young) – oxygen therapy, hyperbaric oxygen therapy particularly, or “energy-modulating therapy” more generally, can become efficient means to alleviate aging-related conditions and increase healthy and productive life. Enhancing blood supply: The main purpose of oxygenation therapy (in particular hyperbaric oxygen therapy) is to directly enhance the supply of potentially deficient oxygen to the tissues that need it (while necessarily watching out against “burning out” and “oxygen toxicity”). However, oxygen supply can be improved by more indirect means, such as improving blood supply to the tissues. Historically, improved blood supply to the tissues (also for the purposes of rejuvenation) has been persistently sought. For example, the whole-body increase of the blood flow (hyperemia) has been achieved by various means ranging from hormone replacement therapy (by supplements, tissue transplants, and even operations on the endocrine organs) through diathermy (tissue heating), massage, exercise and baths.1 The problems of oxygen delivery to the vital tissues have been also tackled with additional approaches, such as oxygenated micro-particles and “artificial blood,”43 various forms of heart-lung machines, artificial hearts and other assisted circulation devices,44 or pharmacological means to improve energy metabolism.28 The blood flow can be also stimulated by electromagnetic devices. As briefly mentioned above, recording electrodes and magnetic resonance devices may be employed for monitoring (for example during the course of oxygen therapy). Yet, in addition, stimulation electrodes may be also used for physiological manipulation purposes, in particular to stimulate nervous activity and blood flow, even to stimulate tissue regeneration, in particular blood vessels growth (angiogenesis – another potential means to improve tissue blood supply and oxygenation, but also requiring caution to avoid uncontrolled growth).45 Such electromagnetic therapeutic devices have been sometimes termed “electroceuticals.”46 They can be incorporated into the therapeutic regimens, either within the pressure chamber or as a part of accompanying regimens. The incorporation or fitting of the additional therapeutic modalities within the pressure chamber can provide cumulative benefits. The ability allowed by the pressure chamber to control and manipulate pressure, gas concentrations and temperature, can produce a convenient environment for physiological manipulation. Furthermore, with the addition of an infusion apparatus for delivering medications, including various regenerative and anti-aging medications (depending on the costs involved), this can become a multifunctional treatment unit. Some of its functions can be as follows. Sleep enhancement: Sleep enhancement can be yet another promising restorative modality (in fact a form of “resting state”). In particular, slow-wave or deep sleep (Stage 3, with synchronized EEG activity, showing slow “delta” waves with a frequency of less than 1 Hz) has been known to be vital for recuperation, presumably due to enhanced growth hormone production51 or synchronization of physiological functions.52 The restorative effects of sleep generally, and deep sleep in particular, may be also possibly due to activation of the immune response during sleep, or elimination of toxins, or other mechanisms.53 This stage can be induced by a variety of methods, including: transcranial direct current stimulation (tDCS) and transcranial magnetic stimulation (TMS),54 other forms of sensory sleep stimulation55 and a variety of slow-wave sleep enhancing drugs.56 Sleeping in a hyperbaric chamber has already been practiced, and this combination of therapeutic modalities can be further explored and expanded, if proven safe and effective. Alexander Vaiserman, Oleh Lushchak, “Anti-aging drugs: where are we and where are we going?” in Alexander Vaiserman (Ed. ), Anti-aging Drugs: From Basic Research to Clinical Practice, Royal Society of Chemistry, London, 2017, pp. 3-10, http://pubs.rsc.org/en/content/ebook/978-1-78262-435-6#!divbookcontent. Giuseppe Orlando, Shay Soker, Robert J. Stratta, Anthony Atala, “Will Regenerative Medicine Replace Transplantation?” Cold Spring Harbor Perspectives in Medicine, 3(8), a015693, 2013, https://www.ncbi.nlm.nih.gov/pmc/articles/PMC3721273/. Ronald Bellamy, Peter Safar, Samuel Tisherman, …, Harvey Zar, “Suspended animation for delayed resuscitation,” Critical Care Medicine, 24(2Suppl), S24-47, 1996, http://www.ncbi.nlm.nih.gov/pubmed/8608704. Toren Finkel, Nikki J. Holbrook, “Oxidants, oxidative stress and the biology of ageing,” Nature, 408(6809), 239-247, 2000, https://www.nature.com/nature/journal/v408/n6809/full/408239a0.html. Gerald J. Gruman, A History of Ideas about the Prolongation of Life. The Evolution of Prolongevity Hypotheses to 1800, Transactions of the American Philosophical Society, Vol. 56(9), Philadelphia, 1966. Gennady G. Rogatsky, Ilia Stambler, “Hyperbaric oxygenation for resuscitation and therapy of elderly patients with cerebral and cardio-respiratory dysfunction,” Frontiers In Bioscience (Scholar Edition), 9, 230-243, June 1, 2017, http://www.bioscience.org/2017/v9s/af/484/2.htm, https://www.bioscience.org/special-issue-details?editor_id=1746, https://www.ncbi.nlm.nih.gov/pubmed/28410116. The standard indications for the use of hyperbaric oxygenation, as established by the US-incorporated Undersea and Hyperbaric Medicine Society (UHMS), include: 1. Air or Gas Embolism, 2. Carbon Monoxide Poisoning, 3. Clostridial Myositis and Myonecrosis (Gas Gangrene), 4. Crush Injury, Compartment Syndrome and Other Acute Traumatic Ischemias, 5. Decompression Sickness, 6. Arterial Insufficiencies, 7. Severe Anemia, 8. Intracranial Abscess, 9. Necrotizing Soft Tissue Infections, 10. Osteomyelitis (Refractory), 11. Delayed Radiation Injury (Soft Tissue and Bony Necrosis), 12. Compromised Grafts and Flaps, 13. Acute Thermal Burn Injury; 14. Idiopathic Sudden Sensorineural Hearing Loss. Richard A. Neubauer Research Institute, “Resources,” www.ranri.org/resources.html. Escobar S.J., Slade J.B., Hunt T.K., Cianci P., “Adjuvant hyperbaric oxygen therapy (HBO2) for treatment of necrotizing fasciitis reduces mortality and amputation rate,” Undersea and Hyperbaric Medicine, 32(6), 437–43, 2005, http://dspace.rubicon-foundation.org/xmlui/bitstream/handle/123456789/4061/16509286.pdf?sequence=1. 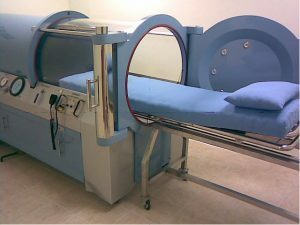 Ingrid Moen, Linda E. B. Stuhr, “Hyperbaric oxygen therapy and cancer – a review,” Targeted Oncology, 7, 233–242, 2012, https://www.ncbi.nlm.nih.gov/pmc/articles/PMC3510426/. Gennady G. Rogatsky, Edward G. Shifrin, Avraham Mayevsky, “Optimal dosing as a necessary condition for the efficacy of hyperbaric oxygen therapy in acute ischemic stroke: a critical review,” Neurological Research, 25(1), 95-98, 2003, http://www.tandfonline.com/doi/abs/10.1179/016164103101201003; https://www.researchgate.net/publication/10920324_Optimal_dosing_as_a_necessary_condition_for_the_efficacy_of_hyperbaric_oxygen_therapy_in_acute_ischemic_stroke_A_critical_review. Elena Afrimzon, Naomi Zurgil, Yana Shafran, Pnina Leibovich, Maria Sobolev, Larissa Guejes, Mordechai Deutsch, “The use of sequential staining for detection of heterogeneous intracellular response of individual Jurkat cells to lysophosphatidylcholine,” Journal of Immunological Methods, 387(1-2), 96-106, 2013, http://www.sciencedirect.com/science/article/pii/S0022175912002992. Noemi Bitterman, “CNS oxygen toxicity,” Undersea and Hyperbaric Medicine, 31(1), 63-72, 2004, http://dspace.rubicon-foundation.org/xmlui/bitstream/handle/123456789/3991/15233161.pdf?sequence=1. Yi Zhang, Shan OuYang, Lan Zhang, XianLing Tang, Zhen Song, Ping Liu, “Oxygen-induced changes in mitochondrial DNA and DNA repair enzymes in aging rat lens,” Mechanisms of Ageing and Development, 131(11-12), 666-673, 2010, http://www.sciencedirect.com/science/article/pii/S0047637410001740. Carole Gauron, Christine Rampon, Mohamed Bouzaffour, Eliane Ipendey, Jérémie Teillon, Michel Volovitch, Sophie Vriz, “Sustained production of ROS triggers compensatory proliferation and is required for regeneration to proceed,” Scientific Reports, 3, 2084, 2013, https://www.nature.com/articles/srep02084. Cassandra A. Godman, Rashmi Joshi, Charles Giardina, George Perdrizet, Lawrence E. Hightower, “Hyperbaric oxygen treatment induces antioxidant gene expression,” Annals of the New York Academy of Sciences, 1197, 178-183, 2010, http://onlinelibrary.wiley.com/doi/10.1111/j.1749-6632.2009.05393.x/abstract. Jeysen Zivan Yogaratnam, Gerard Laden, Levant Guvendik, Mike Cowen, Alex Cale, Steve Griffin, “Can hyperbaric oxygen be used as adjunctive heart failure therapy through the induction of endogenous heat shock proteins?” Advances in Therapy, 24(1), 106-118, 2007, https://oxfordrecoverycenter.com/wp-content/uploads/2017/02/Can-Hyperbaric-Oxygen-Be-Used-as-Adjunctive-Heart-Failure-Therapy-Through-the-Induction-of-Endogenous-Heat-Shock-Proteins.pdf. Stephen R. Thom, Veena M. Bhopale, Omaida C. Velazquez, Lee J. Goldstein, Lynne H. Thom, Donald G. Buerk, “Stem cell mobilization by hyperbaric oxygen,” American Journal of Physiology – Heart and Circulatory Physiology, 290(4), H1378-1386, 2006, http://ajpheart.physiology.org/content/290/4/H1378.long. Claudio Franceschi, Judith Campisi, “Chronic inflammation (inflammaging) and its potential contribution to age-associated diseases,” The Journals of Gerontology Series A, Biological Sciences and Medical Sciences, 69 (Supplement 1), S4-9, 2014, https://academic.oup.com/biomedgerontology/article-lookup/doi/10.1093/gerona/glu057. Joaquin Jordan, Tomas Segura, David Brea, Maria F. Galindo, Jose Castillo, “Inflammation as therapeutic objective in stroke,” Current Pharmaceutical Design, 14, 3549-3564, 2008, http://www.eurekaselect.com/68189/article. Zheng Ding, Wesley C. Tong, Xiao-Xin Lu, Hui-Ping Peng, “Hyperbaric oxygen therapy in acute ischemic stroke: a review,” Interventional Neurology, 2(4), 201-211, 2014, https://www.ncbi.nlm.nih.gov/pmc/articles/PMC4188156/. Kuti Baruch, Aleksandra Deczkowska, Neta Rosenzweig, Afroditi Tsitsou-Kampeli, Alaa Mohammad Sharif, Orit Matcovitch-Natan, Alexander Kertser, Eyal David, Ido Amit, Michal Schwartz, “PD-1 immune checkpoint blockade reduces pathology and improves memory in mouse models of Alzheimer’s disease,” Nature Medicine, 22, 135-137, 2016, http://www.weizmann.ac.il/neurobiology/labs/schwartz/sites/weizmann.ac.il.neurobiology.labs.schwartz/files/2016_natmed.pdf. Gerd Heusch, Hans Erik Bøtker, Karin Przyklenk, Andrew Redington, Derek Yellon, “Remote Ischemic Conditioning,” Journal of the American College of Cardiology, 65(2), 177-195, 2015, https://www.ncbi.nlm.nih.gov/pmc/articles/PMC4297315/. Wenjun Yan, Zongping Fang, Qianzi Yang, Hailong Dong, Yan Lu, Chong Lei, Lize Xiong, “SirT1 mediates hyperbaric oxygen preconditioning-induced ischemic tolerance in rat brain,” The Journal of Cerebral Blood Flow & Metabolism, 33(3), 396-406, 2013, https://www.ncbi.nlm.nih.gov/pmc/articles/PMC3587810/. Xiao-qian Liu, Rui Sheng, Zheng-hong Qin, “The neuroprotective mechanism of brain ischemic preconditioning,” Acta Pharmacologica Sinica, 30(8), 1071-1080, 2009, https://www.ncbi.nlm.nih.gov/pmc/articles/PMC4006675/. Mikhail V. Blagosklonny, “Hormesis does not make sense except in the light of TOR-driven aging,” Aging (Albany NY), 3(11), 1051-1062, 2011, http://www.aging-us.com/article/100411/text. Liran I. Shlush, Karl L. Skorecki, Shalev Itzkovitz, Shiran Yehezkel, Yardena Segev, Hofit Shachar, Ron Berkovitz, Yochai Adir, Irma Vulto, Peter M. Lansdorp, Sara Selig, “Telomere elongation followed by telomere length reduction, in leukocytes from divers exposed to intense oxidative stress – implications for tissue and organismal aging,” Mechanisms of Ageing and Development, 132(3), 123-130, 2011, http://www.sciencedirect.com/science/article/pii/S0047637411000224. Vasilij N. Novoseltsev, Janna Novoseltseva, Anatoli I. Yashin, “A homeostatic model of oxidative damage explains paradoxes observed in earlier aging experiments: a fusion and extension of older theories of aging,” Biogerontology, 2(2), 127-138, 2001, https://link.springer.com/article/10.1023/A:1011511100472. Khatchik Muradian, “Atmosphere, Metabolism and Longevity,” in Alexander M. Vaiserman, Alexey A. Moskalev, Elena G. Pasyukova (Eds. ), Life Extension: Lessons from Drosophila, Dordrecht, Springer, 2015. Reuven Tirosh, “Ballistic Protons and Microwave-induced Water Solitons in Bioenergetic Transformations,” International Journal of Molecular Sciences, 7(9), 320-345, 2006, http://www.mdpi.com/1422-0067/7/9/320. Angela Navarrete-Opazo, Gordon S. Mitchell, “Therapeutic potential of intermittent hypoxia: a matter of dose,” American Journal of Physiology – Regulatory, Integrative and Comparative Physiology, 307(10), R1181-1197, 2014, http://ajpregu.physiology.org/content/307/10/R1181. Aneesh B. Singhal, “A review of oxygen therapy in ischemic stroke,” Neurological Research, 29(2), 173-183, 2007, http://www.tandfonline.com/doi/abs/10.1179/016164107X181815. Paul M. Macey, Mary A. Woo, Ronald M. Harper, “Hyperoxic Brain Effects Are Normalized by Addition of CO2,” PLoS Medicine, 4(5), e173, 2007, https://doi.org/10.1371/journal.pmed.0040173. Gennady G. Rogatsky, Edward G. Shifrin, Avraham Mayevsky, “Physiologic and biochemical monitoring during hyperbaric oxygenation,” Undersea and Hyperbaric Medicine, 26(2), 111-122, 1999, https://www.researchgate.net/publication/12927497_Physiologic_and_biochemical_monitoring_during_hyperbaric_oxygenation_A_review. Nili Zarchin, Sigal Meilin, Joseph Rifkind, Avraham Mayevsky, “Effect of aging on brain energy-metabolism,” Comparative Biochemistry and Physiology Part A: Molecular & Integrative Physiology, 132(1), 117-120, 2002, http://www.sciencedirect.com/science/article/pii/S1095643301005372. Linda P. Fried, Catherine M. Tangen, Jeremy Walston, Anne B. Newman, Calvin Hirsch, John Gottdiener, Teresa Seeman, Russell Tracy, Willem J. Kop, Gregory Burke, Mary Ann McBurnie, for the Cardiovascular Health Study Collaborative Research Group, “Frailty in older adults: evidence for a phenotype,” Journal of Gerontology A, Biological Sciences and Medical Sciences, 56(3), M146–M156, 2001, http://www.sld.cu/galerias/pdf/sitios/gericuba/fenotipo_frailty.pdf. Avraham Mayevsky, Efrat Barbiro-Michaely, “Shedding light on mitochondrial function by real time monitoring of NADH fluorescence: II: human studies,” International Journal of Clinical Monitoring and Computing, 27(2), 125-145, 2013, https://link.springer.com/article/10.1007/s10877-012-9413-6. Georg Fuellen, Paul Schofield, Thomas Flatt, Ralf-Joachim Schulz, Fritz Boege, Karin Kraft, Gerald Rimbach, Saleh Ibrahim, Alexander Tietz, Christian Schmidt, Rüdiger Köhling, Andreas Simm, “Living Long and Well: Prospects for a Personalized Approach to the Medicine of Ageing,” Gerontology, 62(4), 409-416, 2016, https://www.researchgate.net/publication/287212601_Living_Long_and_Well_Prospects_for_a_Personalized_Approach_to_the_Medicine_of_Ageing. David Blokh, Ilia Stambler, “Quantified Longevity Guide (QLG),” Comorbidity Detection Technologies, 2017, https://ec.europa.eu/eip/ageing/commitments-tracker/a3/quantified-longevity-guide-qlg_en, http://www.longevityisrael.org/comorbidity-detection.html, http://www.qlongevityguide.com/. Thad Henkel-Honke, Mark Oleck, “Artificial oxygen carriers: A current review,” AANA Journal, 75(3), 205-211, 2007, https://www.aana.com/newsandjournal/Documents/henkelhanke205-211.pdf. Emma J. Birks, Patrick D. Tansley, James Hardy, Robert S. George, Christopher T. Bowles, Margaret Burke, Nicholas R. Banner, Asghar Khaghani, Magdi H. Yacoub, “Left Ventricular Assist Device and Drug Therapy for the Reversal of Heart Failure,” New England Journal of Medicine, 355(18), 1873-1884, 2006, http://www.nejm.org/doi/full/10.1056/NEJMoa053063. Robert O. Becker, Gary Selden, The Body Electric. Electromagnetism and the Foundation of Life, Quill, New York, 1985. Kristoffer Famm, Brian Litt, Kevin J. Tracey, Edward S. Boyden, Moncef Slaoui, “Drug discovery: a jump-start for electroceuticals,” Nature, 496(7444), 159-161, 2013, https://www.ncbi.nlm.nih.gov/pmc/articles/PMC4179459/. Kees H. Polderman, “Application of therapeutic hypothermia in the ICU: opportunities and pitfalls of a promising treatment modality,” Intensive Care Medicine, 30, 556-575, 2004, https://link.springer.com/article/10.1007%2Fs00134-003-2151-y. Kurt Kräuchi, Britta Gompper, Daniela Hauenstein, Josef Flammer, Marlon Pflüger, Erich Studerus, Andy Schötzau, Selim Orgül, “Diurnal blood pressure variations are associated with changes in distal-proximal skin temperature gradient,” Chronobiology International, 29(9), 1273-1283, 2012, http://www.chronobiology.ch/wp-content/uploads/2014/11/krauchi__bloodpressure_2012.pdf. Jill Waalen, Joel N. Buxbaum, “Is Older Colder or Colder Older? The Association of Age With Body Temperature in 18,630 Individuals,” Journal of Gerontology A, Biological Sciences and Medical Sciences, 66A(5), 487-492, 2011, https://www.ncbi.nlm.nih.gov/pmc/articles/PMC3107024/. Eve Van Cauter, Laurence Plat, Martin B. Scharf, Rachel Leproult, Sonya Cespedes, Mireille L’Hermite-Balériaux, Georges Copinschi, “Simultaneous Stimulation of Slow-wave Sleep and Growth Hormone Secretion by Gamma-hydroxybutyrate in Normal Young Men,” Journal of Clinical Investigations, 100(3), 745-753, 1997, https://www.ncbi.nlm.nih.gov/pmc/articles/PMC508244/. Ladyslav V. Vyazovskiy, Kenneth D. Harris, “Sleep and the single neuron: the role of global slow oscillations in individual cell rest,” Nature Reviews Neuroscience, 14, 443-451, 2013, http://www.nature.com/nrn/journal/v14/n6/abs/nrn3494.html. Tarja Porkka-Heiskanen, Robert E. Strecker, Mahesh Thakkar, Alvhild A. Bjørkum, Robert W. Greene, Robert W. McCarley, “Adenosine: a mediator of the sleep-inducing effects of prolonged wakefulness,” Science, 276, 1265-1268, 1997, https://www.ncbi.nlm.nih.gov/pmc/articles/PMC3599777/. Marcello Massimini, Fabio Ferrarelli, Steve K. Esser, Brady A. Riedner, Reto Huber, Michael Murphy, Michael J. Peterson, Giulio Tononi, “Triggering sleep slow waves by transcranial magnetic stimulation,” Proceedings of the National Academy of Sciences USA, 104(20), 8496-8501, 2007, http://www.pnas.org/content/104/20/8496.full. Jessa Gamble, “Sleep and dreaming: Slumber at the flick of a switch,” New Scientist, 2902, February 06, 2016, https://www.scribd.com/document/124630444/New-Scientist-Sleep-and-Dreaming-Slumber-at-the-Flick-of-a-Switch. James K. Walsh, Ellen Snyder, Janine Hall, Angela C. Randazzo, Kara Griffin, John Groeger, Rhody Eisenstein, Stephen D. Feren, Pam Dickey, Paula K. Schweitzer, “Slow Wave Sleep Enhancement with Gaboxadol Reduces Daytime Sleepiness During Sleep Restriction,” Sleep, 31(5), 659-672, 2008, https://www.ncbi.nlm.nih.gov/pmc/articles/PMC2398757/.